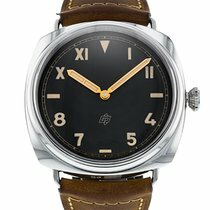 Serviced by Panerai UK in August 2017: An excellent condition pre-owned stainless steel 47mm case size mechanical hand-wound movement Panerai Radiomir California (PAM00424) featuring a historic half Roman half Arabic numeral dial with a Sapphire crystal caseback that shows off the stunning movement. 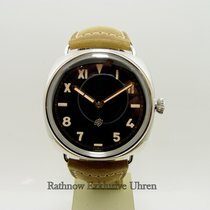 This dial is surrounded by a polished finish stainless steel domed bezel and the watch comes on a distressed light brown calf skin Panerai strap. This particular watch comes complete with its original Panerai box, original purchase receipt and all relevant paperwork being originally UK supplied as new on 18th December 2013. This particular watch has recently been back to Panerai's UK service centre where it underwent a complete service and refurbishment. The service paperwork for this will be provided with the watch which was completed on 7th August 2017.